When I think of the Sony Walkman, I picture a portable cassette tape player. I should have known that the company has stayed with the times and kept innovation flowing, but in these times of the iPod, I hadn’t given the Walkman much thought. However, my super-portable iPod shuffle bit the dust awhile back, and I’ve been in severe need of a more portable MP3 player ever since (the big iPod can be a bit cumbersome during a workout). So when Sony contacted us to try its new wire-free water-resistant MP3 player, for free, I signed right up. The device was super easy to set up. You plug it into your computer and within minutes are transferring songs from your iTunes folder over to the MP3 player. With 2GB of capacity, the device can hold a whopping 470 songs—plenty for weeks of workout music variety. And in case you forget to charge it, a mere three minutes plugged in will earn you 90 minutes of play time. Score! I was most excited about the fact that I wouldn’t have to deal with long wires connecting to headphones, but I was wary that the in-ear Bluetooth-style unit wouldn’t stay in my ears. As I’ve lamented previously, I have small ears and can never get earbuds to stay put. But the player came with three pairs of earbuds so you can find the ones that will stay put in your ears. Plus, the angle of the buds somehow miraculously kept them in place, although I did have a problem with the cord flipping out from behind my left ear, which drove me a little crazy. I remedied that sitch by putting my sunglasses over the cord, which helped it stay put. But because the buds stayed in my ears no matter what the cord was doing, it wasn’t a deal breaker. 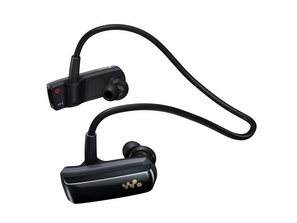 Want to try the new Walkman? We know you do! Comment below with how the Sony would help you rock out your workout, and you’ll be entered for a chance to win. Winners will be contacted in about a week via email. U.S. residents only, please!